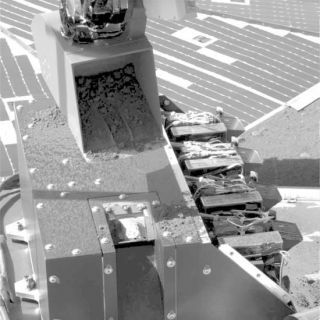 The Robotic Arm on NASA's Phoenix Mars Lander has just delivered the first sample of dug-up soil to the spacecraft's microscope station in this image taken by the Surface Stereo Imager during the mission's Sol 17 (June 12), or 17th Martian day after landing. The scoop is positioned above the box containing key parts of Phoenix's Microscopy, Electrochemistry and Conductivity Analyzer, or MECA, instrument suite. It has sprinkled a small amount of soil into a notch in the MECA box where the microscope's sample wheel is exposed. This image has been lightened to make details more visible.